Definitely Bally, looks like an E1000 or E2000. Looking for a win meter on the right, but can't see if it's there at that angle. It'd be a red LED readout. Looking at the pic with a magnifying glass doesn't look like there is an LED. No svc call button on the front if that helps. The 1st 2 machines look like there might be a marquee on the top and are they lowboys? If you look at the 3rd machine you can see it's a taller cabinet with what can be seen just above the shirt sleeve. The full pic is my grandpa smoking a cigar while playing the machine is why I'm interested. This machine is a Bally Money Honey model 742A produced in 1964, we were the first distributors of Bally in the U.K. before Bally got approved for the Nevada market, my ex partner Cyril Shack now 91 years old gave Bally the name for the 742A-Money Honey, see Bueschels book Lemons, Cherries and Bell- Fruit Gum, page 136.
, it was the introduction of these Hopper payout model that made Nevada what it is today. Thanks Mr. Bailey for the great info. Sometimes I read your posts just to learn a little. I have a couple of questions regarding the Money Honey. Did the first versions of these machine have white sides or a white star on the side of them? I think I read somewhere that these early versions used different voltage in the relays. Don't know if that is true or not. I have owned a couple 742 machines. Very well built and as long as they don't have rust / corrosion in them they should last forever. Yes you are quite right, the first Money Honey dodel had a white flash on the sides, the original model also had a bottom glass showing two dummy jackpots, the Nevada Gaming Commission would not allow this, and Bally had to change it with their famous Bally name emblazoned accross the bottom glass and surrounded with various fruit symbals. 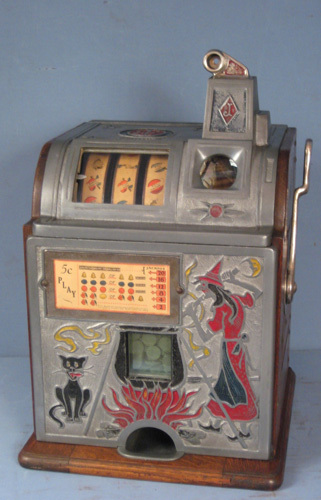 The original forerunner to the Money Honey was derived from the 1946 Bally High Boy model, they used the original mechanism with various modifications, that used a 110 volt circuit, this was called the commander, my late partner Mickey Wichinsky installed the first models in the Sands casino, but they fell to pieces in the first two weeks, then Doc Kaufman and Bob Harpling of Bally resigned the cabinet and handle mechanism, stepped down the voltage to 50 volts and the model 742 was born, it was later named Money Honey by another partner of mine in the 1960's by the name of Cyril Shack. Mickey Wichinsky then installed the new models in the Tropicana Casino, but they would mysteriously pay out when the airplanes landing at the nearby airport was flying overhead. so they went back to the drawing board and the 742 was the official first modern Bally slot machine that made Vegas what it is today, I have attached pictures of both the originally Commander , the reel mech from both the 1946 and 1963 models, along with the front of the original brochure for the White sided Money Honey. A great machine.